Pingback: Giovanni Aldini, Reanimator – YOU SERIOUS, CLARK? Pingback: ????? ?????? ……. ????? ?? !! … | ?????????? ??????? ????? ??????? Having watched the documentary of this man, he obviously did not want to participate in this experiment. However, without human volunteers donating their “bodies” to science, how could we have heart transplants, kidney donations, etc. 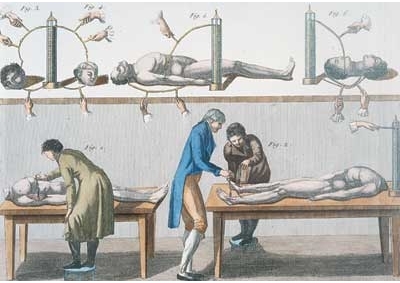 If a person is absolutely willing to use their body for scientific experimentation, I feel that that is far better than using animals, because we are trying to find cures for human ailments, therefore we really do need to do research, tests, experiments, studies, ect. on humans! And yes, I would definitely volunteer myself if it helped mankind.